France did not perceive it at the time, but it placed itself in a trap, and the trap is now closing.In the 1970s, the Palestinians began to use international terrorism, and France chose to accept this terrorism so long as France was not affected. At the same time, France welcomed mass-immigration from the Arab-Muslim world, evidently as part of a Muslim wish to expand Islam. France’s Muslim population has since grown in numbers while failing to assimilate. Polls show that one-third of French Muslims want the full application of Islamic sharia law. They also show that the overwhelming majority of French Muslims support jihad, and especially jihad against Israel, a country they would like to see erased from the face of earth. “It is better to leave than flee.” — Sammy Ghozlan, President of the National Bureau of Vigilance against Anti-Semitism. He was later mugged, and his car was torched. He left. Villiers also mentions the presence in “no-go zones” of thousands of weapons of war. He adds that weapons will probably not even have to be used; the Islamists have already won. Originally, France’s dreams might have been of displacing America as a world power, accessing inexpensive oil, business deals with oil-rich Islamic states, and the prayer of no domestic terrorism. France is in turmoil. “Migrants” arriving from Africa and the Middle East sow disorder and insecurity in many cities. The huge slum commonly known as the “jungle of Calais” has just been dismantled, but other slums are being created each day. In eastern Paris, streets have been covered with corrugated sheets, oilcloth and disjointed boards. Violence is commonplace. France’s 572 “no-go zones,” officially defined as “sensitive urban areas”, continue to grow, and police officers who approach them often suffer the consequences. Recently, a police car drove into an ambush and was torched while the police were prevented from getting out. If attacked, police officers are told by their superiors to flee rather than retaliate. Many police officers, angry at having to behave like cowards, have organized demonstrations. No terrorist attacks have taken place since the slaughter of a priest in Saint-Etienne-du-Rouvray on July 26, 2016, but intelligence services see that jihadists have returned from the Middle East and are ready to act, and that riots may break out anywhere, any time, on any pretext. Although overwhelmed by a domestic situation it barely controls, the French government still intervenes in the world affairs: a “Palestinian state” is still its favorite cause, Israel its favorite scapegoat. France did not stop there. The government then decided to organize a new conference in December. This time, with Israel and the Palestinians. Israel’s Prime Minister Benjamin Netanyahu, noting that Israel does not need intermediaries, refused the invitation. Palestinian leaders accepted. Saeb Erekat, the Palestinian Authority spokesman congratulated France, adding, not surprisingly, that the Palestinian Authority had “suggested” the idea to the French. Now Donald Trump is the U.S. president-elect, and Newt Gingrich is likely to play a key role in the Trump Administration. Gingrich said a few years ago that there is no such a thing as a Palestinian people, and added last week that settlements are in no way an obstacle to peace. As such, the December conference looks as if it might be another failure. French diplomats nevertheless are working with Palestinian officials on a UN resolution to recognize a Palestinian State inside the “1967 borders” (the 1949 armistice lines), but without any peace treaty. They are apparently hoping that outgoing U.S. President Barack Obama will not use the American veto at the Security Council, allowing the passage of the resolution. It is not certain at all that Barack Obama will want to end his presidency on a gesture so openly subversive. It is almost certain that France will fail there too. Again. For many years, France seems to have built its entire foreign policy on aligning itself with the Organization of Islamic Cooperation (OIC): 56 Islamic countries plus the Palestinians. Originally, France’s dreams might have been of displacing America as a world power, accessing inexpensive oil, business deals with oil-rich Islamic states, and the prayer of no domestic terrorism. All four have been washouts. It is also obvious that France has more urgent problems to solve. France persists because it is desperately trying to limit problems that probably cannot be solved. In the 1950s, France was different from what it is now. It was a friend of Israel. The “Palestinian cause” did not exist. The war in Algeria was raging, and a large majority of French politicians would not even have shaken hands with unrepentant terrorists. France signed trade and military agreements with various Arab dictatorships. To seduce its new friends, it eagerly adopted an anti-Israel policy. When, in the 1970s, terrorism in the form of airplane hijackings was invented by the Palestinians, and with the murder of Israeli athletes at the 1972 Munich Olympics, “the Palestinians” all at once became a “sacred cause” and a useful tool for leverage in the Arab world, France, adopting the “cause,” became rigidly pro-Palestinian. The Palestinians began to use international terrorism, and France chose to accept this terrorism so long as France was not affected. At the same time, France welcomed mass-immigration from the Arab-Muslim world, evidently as part of a Muslim wish to expand Islam. The Muslim population has since grown in numbers, while failing to assimilate. France did not perceive it at the time, but it placed itself in a trap, and the trap is now closing. France’s Muslim population seems anti-French in terms of Judeo-Christian, Enlightenment values, and pro-French only to the extent that France submits to the demands of Islam. As France’s Muslims are also pro-Palestinian, theoretically there should have been no problem. But France underestimated the effects of the rise of extremist Islam in the Muslim world and beyond. More and more, French Muslims consider themselves Muslim first. Many claim that the West is at war with Islam; they see France and Israel as part of the West, so they are at war with them both. They see that France is anti-Israel and pro-Palestinian, but they also see that several French politicians maintain ties with Israel, so they likely think that France is not anti-Israel and pro-Palestinian enough. They see that France tolerates Palestinian terrorism, and seem not to understand why France would fight Islamic terrorism in other places. To please its Muslims, the French government may believe it has no choice other than to be as pro-Palestinian and as anti-Israel as possible — even though it looks as if this policy is failing badly in the polls. The French government undoubtedly sees that it cannot prevent what increasingly looks like a looming disaster. This disaster is already taking place. Perhaps France’s current government is hoping that it might delay the disaster a bit and avoid a civil war. Perhaps, they might hope, the “no go zones” will not explode — at least on their watch. France today has six million Muslims, 10% of its population, and the percentage is growing. Polls show that one-third of French Muslims want the full application of Islamic sharia law. They also show that the overwhelming majority of French Muslims support jihad, and especially jihad against Israel, a country they would like to see erased from the face of earth. The leading French Muslim organization, the Union of Islamic Organizations of France, is the French branch of the Muslim Brotherhood, a movement that should be listed as a terrorist organization for its open wishes to overthrow Western governments. The Muslim Brotherhood is primarily financed by Qatar, a country that invests heavily in France — and that has the comfort of its very own U.S. airbase. Jews are leaving France in record numbers, and these departures do not stop. Sammy Ghozlan, President of the National Bureau of Vigilance against Anti-Semitism, repeated for many years that, “It is better to leave than flee.” He was mugged. His car was torched. He left, and now lives in Israel. The rest of the French population clearly sees the extreme seriousness of what is happening. Some of them are angry and in a state of revolt; others seem resigned to the worst: an Islamist takeover of Europe. The next French elections will take place in May 2017. French President François Hollande has lost all credibility and has no chance of being reelected. Whoever comes to power will have a difficult task. The French seem to have lost confidence in Nicolas Sarkozy, so they will probably choose between Marine Le Pen, Alain Juppé or François Fillon. Marine Le Pen is the candidate of the far-right National Front. Alain Juppé is the mayor of Bordeaux, and often campaigns in the company of Tareq Oubrou, imam of the city. Until recently, Tareq Oubrou was a member of the Muslim Brotherhood. Alain Juppé seems to believe that the present disorder will calm down if France fully submits. Three years ago, the French philosopher Alain Finkielkraut published a book, The Unhappy Identity (L’identité malheureuse), describing the dangers inherent in the Islamization of France and the major disorders that stem from it. Juppé chose a campaign slogan intended to contradict Finkielkraut: “The Happy Identity“. Zemmour defines the arrival of millions of Muslims in France during the last five decades as an invasion, and the recent arrival of hordes of migrants as the continuation of that invasion. He depicts the creation of “no-go zones” as the creation of Islamic territories on French soil and an integral part of a colonization process. He writes that the eruptions of violence that spread are signs of an imminent explosion; that sooner or later, revolt will gain ground. Another book, Will the Church Bells Ring Tomorrow? (Les cloches sonneront-elles encore demain? ), was recently published by a former member of the French government, Philippe de Villiers. 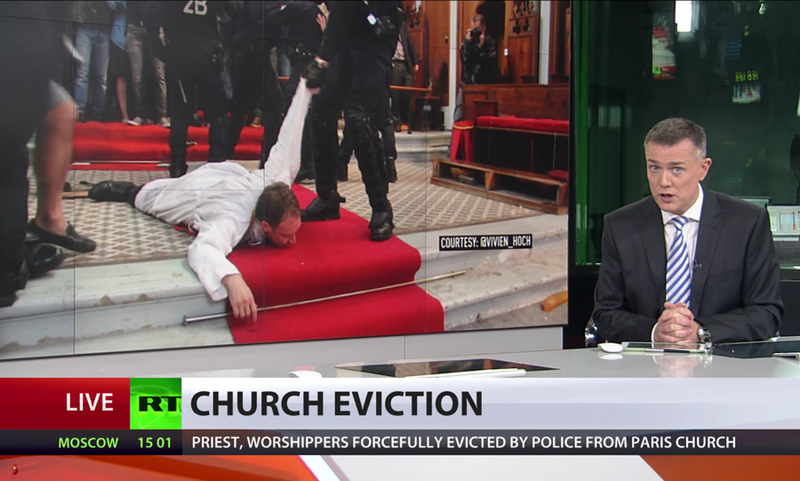 Villiers notes the disappearance of churches in France, and their replacement by mosques. He also mentions the presence in “no-go zones” of thousands of weapons of war (AK-47 assault rifles, Tokarev pistols, M80 Zolja anti-tank weapons, etc). He adds that weapons will probably not even have to be used — the Islamists have already won.